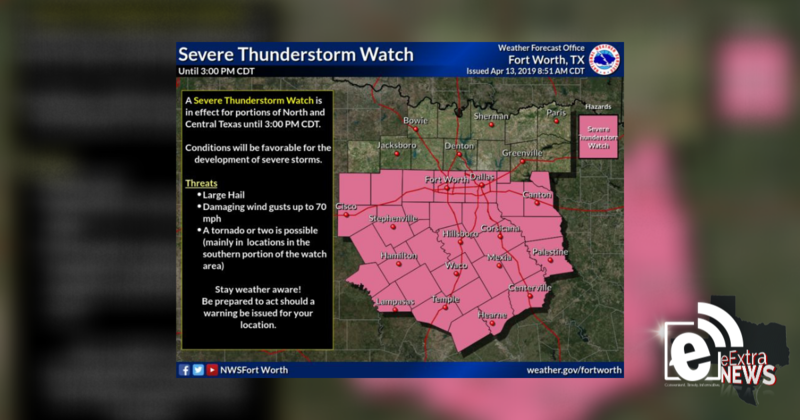 A Severe Thunderstorm Watch is in effect for portions of North and Central Texas until 3 p.m. Conditions will be favorable for the development of severe storms. The primary threats include: large hail, damaging wind gusts up to 70 mph and a tornado or two is possible mainly in locations in the southern portion of the outlined watch area. Stay weather aware today, and be prepared to act should a warning be issued for your location. It will be unseasonably cold tonight across North and Central Texas. Some locations across the Big Country and along the Red River will fall into the 30s. Breezy north winds of 20 to 30 MPH should mitigate the frost potential, but it may feel even colder with wind chill values in the 20s and 30s area-wide. There will be a low chance for a few lingering showers and storms north of I-30 and east of I-20.